This is going to be an interesting night. Denver beat UMD 5-1 last night, scoring the final four goals of the game and making the final score more lopsided than the game was. From the perspective of a guy who doesn't know much about the game, it was not a good night for the Bulldogs in many ways. Denver had four goals that looked to be too easy from my press box view. The other goal trickled in off a defenseman's skate. It didn't look like UMD's best effort, and afterward, DU coach George Gwozdecky talked up the notion that his team didn't play very well. I disagree, but it's not my team. I thought Denver was pretty sharp last night, with the exception of some four-on-four play in the second period that UMD controlled. Denver had a hefty edge in shots on goal for most of the game, and they pulled away with two late goals to make the margin 5-1. I expect UMD will come out stronger tonight. As for potential lineup changes, we'll see if coach Scott Sandelin decides to use sophomore defenseman Chase Ryan, who traveled as the extra defenseman on this trip. Freshman forward Mike Montgomery may see his first action of the season, but it depends on what Sandelin decides to do with his forward lines. There's a chance that Montgomery will only play because of injury, but I don't know that. It was a hard game for both teams, and I'm guessing ice was a major commodity in the locker rooms afterward. There was a lot of stickwork in the game, and I noticed a lot of slashing and chopping at sticks, which I could have sworn was against the rules. But since Derek Shepherd didn't call it, there must not have been anything going on there. I won't bother to project lines for tonight. I don't know who's healthy and who isn't, and I don't know what the coaches are going to want to do with lines that, until last night, had worked very well for the team. Obviously, the thoughts of all sports fans are with those affected by the awful fires in San Diego. With today's news that the Chargers will play at home on Sunday as scheduled, here's hoping the NFL steps up and helps with the relief effort, and that the mere presence of a football game will help San Diego residents in the recovery process. Even three hours of relief from reality can be a great thing, and this is what makes sports as cool as they are. People can turn away from the travails of real life. Trust me, there are many, and not just in San Diego. This is just the latest and most notable right now. The Chargers and Texans don't highlight the schedule, but they'll get a little more attention than usual now. And it has the chance to be a really good game. As far as the football goes, the weekend sets up to be quite interesting. The unbeatens, Indy and New England, clash next week, but both have tough games this week first. The Monday Night game should be interesting, and Philadelphia needs a win...badly...to stay in the NFC East race, which sets up for now as a two-team (maybe three if the Redskins get lucky) show. Washington at New England and Indianapolis at Carolina: I lump these games in together because of the unbeaten battle next week. First, the Patriots have to get by the Redskins, who likely present the toughest defense the Pats have faced so far. That 16-point spread is ridiculous, and shows too much love to New England. They're deserving of a lot of love, but Washington will keep that game close. The Redskins should be able to at least make New England sweat on offense, and their running game could cause problems to the Pats' defensive front. The Carolina game is interesting because of the news today that Vinny Testaverde will start for the Panthers. Their season could be in the hands of a retired 43-year-old quarterback. Be afraid. Expect Indianapolis to pin the ears back and make the Panthers run the ball to win. Testaverde won't be allowed to pick the Colts' defense apart. If Carolina's defense plays well, they actually have a better shot at the outright win than Washington does, but it won't happen. It'll set up the battle of unbeatens next week at Indianapolis. Unfortunately, Phil Simms will be working. Sorry. I can't control those things. Green Bay at Denver (Monday night): What a zoo out here. I just wish I was staying here for this one. It's okay, though, because based on what I saw in a walk around my hotel today, there will be plenty of Packer fans in attendance Monday night. At least, they'll be here. Maybe they can scalp their way in. The Packers will run for over 100 yards in this game. Denver's run defense is atrocious, and they appear to be expecting a Brett Favre air assault. Instead, look for the Packers to come out like they did against Chicago (only minus, hopefully, the fumbles and stupid mistakes and bad officiating). They'll make Denver crowd the line of scrimmage, and then take their shots down the field. I just don't think Denver has the secondary to shut the Packers down, especially if Green Bay makes them defend the run. Philadelphia at Minnesota: So, Tarvaris Jackson has a broken finger. On his throwing hand. And he might play Sunday! In other news, Adrian Peterson will probably have his carries held down again on Sunday. Turns out he was moving some furniture in his house during his off-day this week, and Vikings head coach Brad Childress is concerned that Peterson will tire quickly on Sunday if he's overused. The NCAA and University of North Dakota have settled UND's lawsuit over a nickname ban (of sorts) enacted by the NCAA. The organization asserted that the use of "hostile and abusive" American Indian nicknames and mascots would prevent schools from hosting NCAA Tournament events, and the schools found in violation of the policy would not be allowed to use their logos or mascots at NCAA playoff events. The agreement requires the school to win tribal approval for its Fighting Sioux nickname and logo within three years or retire it. UND must win approval from the tribal councils of both the Standing Rock and Spirit Lake reservations. If that approval is granted, it may be withdrawn at any time and UND must change its nickname within one year, said Attorney General Wayne Stenehjem. According to the settlement, the NCAA also must post on its Web site a statement essentially withdrawing its claim that UND is hostile and abusive. Stenehjem said the agreement already has been signed by the NCAA. 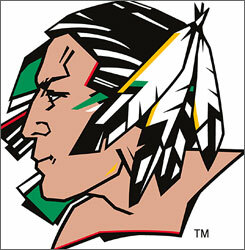 If the logo is retired, some of the more permanent Native American imagery may remain on the Ralph Engelstad Arena. UND is suing the NCAA over its ban of American Indian nicknames and logos in postseason play. If UND can convince the state's Sioux tribes to support its nickname, the school could continue to use it in NCAA tournaments. This settlement was bound to happen, given the fact that Judge Lawrence Jahnke was not willing to unseal documents in the case earlier this week. The news media had requested the unsealing, but one reason to keep documents sealed is because the sides are still discussing a settlement, and the release of the documents could jeopardize their ability to settle. The settlement is a piece of good news, because now UND can go to work on convincing Sioux tribes in North Dakota that they want to have a relationship and not be recognized as hostile and abusive. The NCAA can work on governing college sports, which is their job, and get away from trying to be socially active. For fans, it may not mean anything in the end. When October 2010 rolls around, hopefully UND has done the necessary work to keep a nickname that is steeped with tradition in North Dakota. I don't often worry about things like polls. As seriously as I take the BlogPoll voting every week, I rarely concern myself with how the poll ends up. It's good for discussion, and not to be taken personally. And it's certainly not something we should lose sleep over. With that in mind, I'm going to start here with a defense of my fellow BlogPollers before I get to this week's picks. This week's poll, as you can see on the right of this page, ranks West Virginia ahead of South Florida. Since both teams are 6-1 (1-1 Big East), it does make sense to believe that USF's head-to-head win should be the most important thing between the two teams. Normally, I would agree. After all, the Bulls won 21-13. Fair and square. No outside interference. No chairshots behind the referee's back. Nothing. They won, and they deserved to win. That was four weeks ago. In fact, Sunday marks exactly one month since the September 28th game in Tampa. Things change. 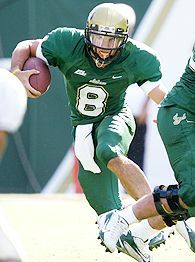 Since that game, USF has an underwhelming win over (gulp) Florida Atlantic, and they lost last week to Rutgers. West Virginia hasn't beaten anyone good, but they have stomped everyone else they played, taking care of business to the point where the closest win was 31-14 over Maryland. Teams should be ranked without regard to future schedules. Please don't rank Purdue high because they miss Michigan and Ohio State this year. Teams should also not be ranked on their performance in previous years. At all times it should be an approximate ranking who would beat who on a neutral field this year. Emphasis mine. Yes, South Florida already beat West Virginia. And they deserved a high ranking. Still do (they're spot in the poll is nothing to sneeze at). However, there are things to consider here. The game was in Tampa. That's to point out that it was NOT on a neutral field. The final was 21-13, a one-score margin. West Virginia outgained South Florida 437-274. West Virginia had 21 first downs to 13 for USF. West Virginia had almost ten minutes more possession time than USF. It's not every day that WVU commits six turnovers in a game. Their best player, QB Pat White, was injured and couldn't finish the game. What am I saying? I'm saying that it's not completely indefensible to say that West Virginia would beat South Florida on a neutral field. After all, how much weight are we going to put on a head-to-head meeting? If South Florida had three losses, would we still be obligated to rank them ahead of WVU? BlogPollers, please discuss. I'm moving on to picks. Indiana at Wisconsin: This game might mean more for the Hoosiers than the Badgers. Wisconsin has virtually no shot at a major bowl at this point, and Indiana still needs a win to qualify for a bowl. For them, a bowl game this year would mean everything. The Badgers can't stop the run, no matter what they did against putrid Northern Illinois (-13 yards). Indiana will spread the Badgers out and run for at least 200 yards, or they won't win. And even if that happens, IU might not win. Their defense couldn't stop Penn State, and Wisconsin's offense is also pretty good (don't laugh, Penn State fans - that was an aberration, I hope). I'll take the Badgers at home, though this is going to be a really good game. Michigan State at Iowa: The Hawkeyes impressively defended home field against Illinois a couple weeks ago, and they followed up on that by getting throttled at Purdue. Iowa is a tough team to figure out, but I think they'll take care of the home turf Saturday. Michigan State is driven by their running game, and that's Iowa's strength on defense. The Hawkeyes will find enough holes in the Spartan defense to control the clock and win. Ohio State at Penn State: I'm tempted. I think Penn State can move the ball on tOSU's defense. I think their defense can cause Boeckman and company problems. I think 100,000-plus fans will cause tOSU problems. And I'm still somewhat cautious about the Buckeyes after what happened last year (yeah, I know, last year was last year, but it's tough to forget about how that season ended). The Nittany Lions offense is just too scattershot for my taste. They can move the ball, but as evidenced by the Michigan game earlier in the season, they don't always do that. I'll take tOSU, with full knowledge that I could be overthinking this one. West Virginia at Rutgers: Here's WVU's shot at showing all the skeptics that they deserve a higher spot in the polls, even with one loss. Rutgers pulled out all the stops against USF, using a fake punt and a fake field goal to net them ten points in a three-point win. They'll do everything they can to beat WVU, but they can't do enough. The Mountaineers will run the ball, White won't get hurt, and they won't turn it over six times. USC at Oregon: Both teams have impressed, and both teams have found ways to lose at home. USC can run the football, which will be an issue for Oregon's defense. However, I think Oregon's balanced offense and home crowd are bigger obstacles. We know the Trojans will come to play, as they always do in big road games. It just won't be enough in this one. Ducks win. It's always fun to travel with the team that I cover. I only get to do this three or four times a year, so I relish the opportunity. Just being around the guys gives me a certain insight into the way these guys get along together. And this group is very close. The freshmen seem to have acclimated themselves quite well, and it's a very likable bunch. It also gives me an extra day to think about the games. This can be good and bad, as witnessed by my "basket case" behavior before Game Three against Denver in March 2006. That was a tough day, being that we flew in here Wednesday night that week. I had Thursday to myself, and then Saturday's game was ripe with controversy. To make it all worse, we knew Minnesota was getting socked with a snowstorm that Monday, so traveling back was going to be a bear. So we're here in Denver. It's nice out, maybe a bit too nice, considering that November starts in a week. The line of the day came from a UMD player when we got off the bus at Magness Arena earlier today. "Why did we go to Tallahassee?" Just think. These people got four inches of snow on Sunday. And now it's - um, let me check - 75. Yes. 75. And we're here for a hockey series. Isn't that odd? This series should be about goaltending. This isn't to disrespect talented forwards like Tyler Ruegsegger, Rhett Rhakshani, Brock Trotter, MacGregor Sharp, Nick Kemp, or anyone else. But UMD's Alex Stalock has a .941 save percentage so far. Peter Mannino of Denver is at .935. If they keep playing at that level, this series will be about goaltending. Stalock is off to a great start. I don't necessarily buy into this "He's not moving as much, and it's helped his game" thing. He's still moving around quite a bit, ranging right and left to play loose pucks and try to knock pucks away from charging opponents. What's noticeable, however, are two key factors. For one, Stalock is doing a better job choosing when to wander and when to stay put. I'm not sure there's an exact science involved here. Putting it as simply as I can, it's about making sure he has a place to go with the puck if he decides to go after it, and it's about making sure he's not putting himself in peril by trying to play a puck in traffic, where one bounce can lead to disaster if he doesn't get back to the net. I also think he has a better rapport with his defensemen this year. That helps. They know him better, and they're aware of situations where he will go after the puck. You can't put a price on the chemistry that is only brought on with experience. For many of these UMD defensemen, this is the first time they've ever played with a goalie like Stalock. Sure, all goalies wander, but Stalock's skating and passing ability are rather unique among goaltenders. Of course, his puck-stopping ability is also pretty good, as Ryan Lasch learned last Saturday. The defense will be tested by Denver's speed. Their top two lines are full of quick guys, and the rink is a tad bigger than the DECC. It's not wider than the DECC, so it shouldn't be a terribly big deal for UMD. But it is worth mentioning, after four straight home games. We're seeing a balanced group of defensemen for UMD, with all six guys getting regular playing time, and they all have important assets. Jason Garrison is a very physical player who also has a wicked shot. Josh Meyers is probably the best offensive defenseman on the team (though Garrison's start this year indicates he will rival Meyers in this department), and he's much improved defensively. The pairing of Travis Gawryletz and freshman Evan Oberg has been rock-solid so far. Coach Scott Sandelin can also get a good pairing out of Jay Cascalenda, Trent Palm, and Chase Ryan. Cascalenda has super speed, which will render him quite the asset on the big ice. Palm's offensive game looks to be coming around to match his already-strong defense. Ryan is a tough soul who doesn't appear as advanced offensively. He was the "seventh" defenseman last weekend in the St. Cloud series, meaning he did not play. As for Denver, George Gwozdecky welcomes 14 freshmen this year. It's a huge class, and it provides DU with some depth as well as some fresh talent. With losses like Paul Stastny and Ryan Dingle the last two years, they need all the depth they can find. Tyler Bozak, Jesse Martin, Anthony Maiani, Chris Nutini, and Kyle Ostrow have all found the scoresheet so far, and that would be five more freshmen than UMD has had on the scoreboard (none of the five freshmen who have played for UMD have scored). If there's an advantage for UMD, it's the depth and experience of the Bulldogs. However, Denver is still strong defensively, and Mannino makes up for anything they may be missing on defense. The senior has national championships to his credit already, and he's off to a good start this year in his quest for another one. He is capable of carrying the Pioneers to wins, even in a tough WCHA. For Denver to get back to the NCAA Tournament, they're going to have to score more goals. But it's hard to nitpick a 3-1 start, and it's hard to nitpick Mannino's save percentage. We don't know yet how good St. Cloud State is, so the overall quality of UMD's sweep last weekend can be argued, but a sweep is a sweep. Speaking of sweeps, did you realize that Denver was the only WCHA team that failed to sweep a league series at home last year? I find that incredibly odd. I don't think they'll sweep this weekend, either. This series has "low scoring split" written all over it. I don't know how to say it any other way. Sorry about the inaccurate picture. There are actually no clouds in the sky today. Sunny and 71 as I type. Good deal, methinks. Hockey starts tomorrow. The World Series is here Saturday through (hopefully) Monday. The Packers are here Monday night. The Wild play the Avalanche Sunday. It's busy here. On top of all that, it's homecoming for Denver as they host UMD this weekend. I'll be back with more later today and tomorrow. The trip was nice and uneventful. No mechanical delays like last year, and no weather delays like the year before. No one lost their luggage, though a UMD player lost his wallet on the plane and had to run back from baggage claim to get it (I'll leave the name out). Don't worry. He got it back, and didn't miss the bus out of the airport. I don't have media access to Coors Field, though I wish I did. Then again, after what the Red Sox did to Colorado last night, maybe I don't. I'm pretty sure the Sox were one run away from getting arrested last night. Ouch. Hopefully, Colorado can bounce back. I don't say that as a Rockies fan or anything, but I really do hope this series is good. More later. I have a few things to do right now. I'll post about the games, the Series, the Packers, football picks, and more in the next few days. I have to work on my tan for now. Break out the brooms, Bulldog fans. Not many people saw a UMD sweep of St. Cloud State coming (right, Chris? ), but that's exactly what happened. Perhaps people will begin to see that this UMD team is not to be dismissed just because they lost some really good players from last year's roster. What's most encouraging about this group? There are a few things. The work ethic. Last year, there were times that UMD was outworked. It didn't happen as often in the second half of the season, when UMD put together a run of over-.500 play and surpassed their win and WCHA point totals from the year before. However, the Bulldogs aren't getting outworked right now. They've brought the proverbial lunch bucket to every game so far, and the results have shown themselves. UMD has deserved this 3-0-1 start by not only being better than their opponents, but working harder. Scoring from everyone. The freshmen haven't gotten in on the action yet, but they will if they keep playing well. Justin Fontaine almost broke through with an assist last night, but his pass was just out of the reach of Nick Kemp. Outside of that, the team is balanced with their offense. The top line of MacGregor Sharp, Matt McKnight, and Andrew Carroll wasn't as active on the scoreboard against St. Cloud State (though Carroll did net the empty-netter Saturday), but that was okay. Second-liners Michael Gergen and Nick Kemp scored Friday night, and the third line of Matt Greer, Drew Akins, and Mike Curry contributed two goals and six points on Saturday. They were on the ice for defenseman Jason Garrison's game-winning goal. Garrison and fellow junior Josh Meyers have paced the scoring on defense, with Meyers already up to four points. The scoring balance is going to be an ongoing storyline for the Bulldogs this year if they are to sustain this early success. Defense and goaltending. It's good to see that last year's defensive improvements weren't just a flash in the pan. This team can play defense. Just ask St. Cloud State (7 shots in two periods Friday, then 12 in the first two on Saturday). Or ask Northern Michigan (5 shots in the third period last Saturday). They're making Alex Stalock's job a bit easier, and the sophomore is doing the rest, including a picturesque larceny on Ryan Lasch late in a one-goal game Saturday. Stalock looks comfortable in net, and it's perhaps more important to note that the UMD defense looks more comfortable with Stalock's wandering ways. One of the keys to success with a goalie who likes to skate and play the puck is for defensemen not to get too complacent. Just because the goalie can play the puck doesn't mean that he will. Sometimes, the other team will employ a strategy to limit that. It's nice to see UMD defensemen working with what appears to be an improved rapport with Stalock and his somewhat unorthodox style. Taking care of home ice. After an impressive stretch of home-ice play late last year, the 3-0-1 start is very encouraging. UMD is now 9-2-2 in their last 13 home games going back to the start of the second half last year. This has to continue, and UMD has to show continued improvement on the road this weekend. It's a good place to try to do that, since UMD has had good fortune in Denver lately. They beat a Minnesota team. UMD played ten games against Minnesota schools in the regular season last year. They lost all of them, some of them in gutwrenching fashion (Teddy Bear Toss, anyone?). They beat St. Cloud State once in the playoffs and finished 1-12 against Minnesota teams. This year, I'll take the 2-0 start. Forget the DQ Cup, though that's nice. This is all about beating up the in-state teams. THURSDAY AND THURSDAY NIGHT...MOSTLY CLEAR. HIGHS IN THE LOWER 70S. LOWS IN THE MID 30S. FRIDAY AND FRIDAY NIGHT...PARTLY CLOUDY. HIGHS IN THE LOWER 60S. LOWS IN THE MID 30S. The Packers don't play this week, so who cares? Let's revisit my division predictions, just for fun. If things change, we'll do this again at some point. Thought: Whoda thunk Cincy being this bad? Thought: At least I have 11 weeks left to get it right. Thought: I got the important one right to this point. Thought: I hate the NFC. Thought: Did I mention that I hate the NFC? On to the picks. I'm at least decent at those. Really, we don't know anything. If I asked 100 college football fans to name the two teams they thought were the best in the country, we'd get a ton of different answers, with each one being totally justifiable. I mean, whoda thunk South Florida? Kansas? Boston College? This is the most messed-up year in college football history. I think it sets up as a perfect argument for a playoff, but I'm not going to go there. It's not worth the breath, since I really won't convince anyone. But, really, who are the best two teams in college football right now? Northwestern at Eastern Michigan (Friday): Northwestern is a tough team to get a good read on, but there's no way they lose this game. Penn State at Indiana: The Hoosiers are one win away from being bowl-eligible, and that 13th game would mean a lot to them. Penn State isn't as good as Wisconsin made them look last week, and they will struggle to slow down Indiana's offense. What is questionable, especially after last week, is whether IU can stop the run enough to come out on top. I think they will, though I'm very apprehensive about making this pick. Iowa at Purdue: Neither team is consistent, but Purdue has the ability to spread out the Iowa defense, which is short on depth in the secondary. Iowa should cause some problems with their run game, and could get a second straight win if QB Jake Christensen plays mistake-free. However, Purdue is not a good matchup for Iowa's defense, and they'll win at home. Northern Illinois at Wisconsin: The Badgers have trailed in every game so far this season, and if that's going to change, this would be a good week for it. Wisconsin needs to find their defense, and NIU shouldn't be much of a threat even if the Badgers still can't get that going. North Dakota State at Minnesota: Don't be fooled by "I-AA" (er, FCS) status for NDSU. This team can play. The Gophers have a problem. Even if they show up to play, their defense is sorely overmatched, and the offense is too accident-prone. Yes, I'm serious. Get in line, Appalachian State. Michigan State at Ohio State: Best test this season for the stout tOSU defense. They'll pass, and they'll score just enough to hold Sparty at bay. Michigan at Illinois: Big game for both. The Illini are coming off their first Big Ten loss, and Michigan is trying to continue their resurgence. The Wolverines did a good job against the Purdue spread, but Illinois runs the ball better, making for a tougher matchup for Michigan. The Wolverines will struggle to win a close game, and if Mike Hart can't go full-boar, they're in trouble. South Florida at Rutgers (Thursday): As interesting as this game is, it would be more interesting if Rutgers hadn't fallen flat on their face. Two home losses, and USF primed to make it three. I think Ray Rice will have a good night, but it won't be enough for the Knights to pull off an upset. Dropped Out: Florida State (#20), Purdue (#21), Texas A&M (#23), Colorado (#24). So, yeah. I feel like this can't possibly be anything remotely resembling "right". Why Michigan and Penn State? Because no one else is any good, either. Arizona State only moves up because they're smart enough not to lose while playing in a BCS conference. They will lose, eventually. Hawaii can't move up. They needed overtime to beat San Jose State. It was a great game, but an underwhelming win by a team that couldn't afford an underwhelming win. I really don't know what else to say. I hate this ballot more than any other I've ever done in the BlogPoll. UPDATE: Moved LSU to #1 thanks to a compelling argument by MGoBlog. Moved Kentucky up as well, because they deserve consideration for a higher spot. Sorry, but I have hockey tonight and tomorrow, and much of my energy needs to be focused on that. Here are the picks, starting with this week's college games. From there, we move on to the week in the NFL. More chances to be wrong, I say. Now, on to the top five. Final Five, if you will. It could be argued that the Tigers failed to meet expectations last year. A year filled with the promise of a return to the NCAA Tournament ended on the outside looking in. The Tigers played well early in the season, but faded down the stretch, eventually losing their first-round WCHA playoff series to Michigan Tech. That playoff loss assured CC that they wouldn't make the NCAA Tournament. While some key players are gone, 19 players return from last year's team. How they fill some huge holes will determine how far they can climb up the league table. The good: Bill Sweatt leads the way for an exciting group of forwards. Jimmy Kilpatrick and Chad Rau also return, and UAA transfer Erik Walsky adds depth. There is also some depth on defense, where guys like Jack Hillen and Jake Gannon will lead the way for a young group. The not-so-good: Replacing top-line defensemen Lee Sweatt and Brandon Straub won't be easy, especially while CC is also forced to replace goaltender Matt Zaba. Drew O'Connell is the heir apparent in goal. The Badgers expected to ride All-American goaltender Brian Elliott to another NCAA appearance and a shot at defending their national title last year. Instead, the Badgers struggled so much to score goals that not even Elliott could bail them out most nights. A run to the Final Five came up short, as Wisconsin was beaten by Minnesota in the semi-finals. They missed the dance, as did seven other WCHA teams. This year, Mike Eaves brings in an amazing recruiting class, and the hopes are high for a return to the NCAAs, which would mean a chance to play at home, as the Kohl Center is hosting a regional. The good: Freshmen Kyle Turris and Ryan McDonagh lead the young charge in Madison. Sophomore defenseman Jamie McBain is joined on the blue line by experienced senior Kyle Klubertanz. While he hasn't played much, we know new starting goalie Shane Connelly can play. After all, he's a Wisconsin goaltender, and Wisconsin doesn't often field teams that are subpar in goal. The not-so-good: Exciting players, yes, but they're still freshmen. It will take time to adjust to the college game. Wisconsin is a bit thin on defense, and that may hurt them while they're breaking in a new starting goalie. Much like CC, Denver expected more last year. Instead, they were left out of the NCAAs for a second straight year. It all started in early February, when a 6-4 home loss to UMD started the Pioneers on a season-ending 1-6-2 tailspin. That included a home sweep in the first round of the WCHA Playoffs, as Wisconsin became the third team in four years to win a WCHA playoff series in Denver (CC and UMD before them). Denver has designs on a return to the national tournament, and it will likely become a reality for them, thanks to some super sophomores who look ready to carry this team. The good: Speedy forwards Tyler Ruegsegger and Rhett Rakhshani are joined by blueliner Brock Trotter to make up the sophomore core of the team. Goalie Glen Fisher is gone, but Peter Mannino has posted a .919 save percentage in his DU career. I think they'll be okay there. The not-so-good: Denver has lost a lot of talent, again. The Pioneers appear to be a tad thin on defense, an area that did seem to hurt them at times last year. No matter the method, the Pioneers have to find a way not to wear out Mannino, who has platooned with Fisher and now appears to be the top dog. Minnesota has been as affected as anyone in the league by the recent run of early departures. Guys like Alex Goligoski, Erik Johnson, Kris Chucko, and Phil Kessel have bolted in the last two years, leaving Don Lucia to fill some gaping holes on his roster. Obviously, Lucia can recruit, but teams like this really test his mettle as a coach. Last year, he did a marvelous job bringing together a very talented team that didn't always look interested in playing as a team. When it mattered most, they came together and rallied to avoid another embarrassing NCAA Tournament loss (Air Force). They lost in overtime to North Dakota in the regional final, but getting that far is nothing to hang the head about. The good: Loads of talent. Kyle Okposo spurned the Islanders for another year of college hockey. Guys like Blake Wheeler, Jay Barriball, and Ryan Stoa have shown they can play at this level. Freshman Patrick White wasn't a first-round pick by mistake. Jeff Frazee played well in goal last year, gaining some experience and confidence working with the departed Kellen Briggs. The not-so-good: Goligoski, Johnson, and Mike Vanelli leave a huge hole on defense. It might be too much to ask freshmen Cade Fairchild, Kevin Wehrs, and Stu Bickel to eat big minutes. Frazee becomes the main goaltender. Can he handle that? There's no doubt he has the talent. Frankly, Okposo never looked the same after Tyler Hirsch was kicked off the team. Whenever a team is such an overwhelming pick to win a league title, you have to pick up a little doubt. The quality teams that we have in this league probably take some offense to UND being tabbed an almost universal league title favorite. However, the "obvious" pick is that way for a reason. It just doesn't look like anyone measures up to the Sioux's talent. Of course, there are things that can stand in UND's way, but this is a superb hockey team. They were fortunate in that they didn't lose much to the pros, and now it's time to take advantage of that good fortune. The good: Scorers, defenders, and starting goaltender Jean-Phillippe Lamoureux all return. Blues first-round pick T.J. Oshie is the headliner, along with returning Hobey Baker winner Ryan Duncan. There is depth and grit beyond that top line, thanks to guys like Darcy Zajac, Rylan Kaip, and Matt Watkins. The defense is led by preseason All-American Taylor Chorney. The not-so-good: Top-line stalwart Jonathan Toews is now a Chicago Blackhawk, leaving Dave Hakstol with some pretty big skates to fill. The Sioux were hurt in the Frozen Four by a lack of discipline and poor play from the penalty kill. The discipline issue did creep up a couple times last year, and UND can't afford for it to be a major problem this year. No idea how to approach this. I don't want to sit here and babble endlessly about teams when I'm probably going to be wrong anyway, but it's always nice to give people at least some frame of reference for these teams. If you don't like UMD, don't read ahead. Unlike others in media, I'll freely admit my biases and wear them as a badge. I'm a UMD guy. Deal with it. That said, I'm not silly enough to pick them to win the league. That would be a surprise for me. Pleasant, but a surprise. I picked a 1-10 a couple weeks ago. No one seemed to have much of a problem with my picks, so I'll assume I was close to being right. That said, I made a couple modifications. With apologies for anything important I may have missed (we'll learn about it all eventually, I suppose), I bring you a look at the 2007-2008 Western Collegiate Hockey Association season. Teams will be listed in order from the bottom to the top, mainly because that's what I feel like doing. 10-6 today, and 5-1 tomorrow. Obviously, let me know if you have a gripe. However, don't just complain that your team isn't rated high enough. If you're going to whine about that, at least do enough homework to tell me which team(s) should come down so your team can be higher. Telling me UAA deserves a higher spot does me no good unless you make a case for Michigan Tech or someone else moving down. It's nothing against Alaska, really. I have family in Anchorage (my brother lived there for some 15 years and still has a lot of ties there in his family), and it's one of my favorite WCHA road trips, despite an arena that sets the term "press accommodations" back about 35 years. That's not what this is about, however. I just don't know that UAA has enough power to stick with the top teams in the league. They don't score many goals, and that's not likely to change on a dime this year. What was troublesome was the often-leaky play on defense, which led to a league-high 101 goals allowed in WCHA games. The good: Sophomores Paul Crowder and Josh Lunden. The duo combined for 22 goals and 44 points as freshmen, and both will be called upon for even more this season. The not-so-good: Nathan Lawson bolted, leaving sophomore Jon Olthuis as the only experienced goaltender. Olthuis got better as he gained experience last year, but unless the Seawolves improve their team defense, things won't get better. I actually think this team has a chance to surprise. MSU returns netminders Mike Zacharias and Dan Tormey, and they have a nice group of young forwards to lean on. However, the Mavericks had issues on defense last year, and they were notorious for getting into penalty trouble. In a league where goal-scoring is at more and more of a premium every year (or so it seems), teams that take clusters of penalties find themselves behind the eight-ball quite a bit. The good: Junior Jon Kalinski tallied 17 goals to tie for the team lead last year, and senior Joel Hanson was right behind him with 15. If one or both of these guys can jump to a line in the general vicinity of 20-25--45, the offense will improve even without the graduated Travis Morin. The not-so-good: A defensive corps led by Steve Wagner (6-23--29) last year can't lean on him anymore, as he's now a St. Louis Blue. The Mavs look to be woefully thin on defense, and their goaltenders, while solid, aren't "steal the game" good. Last year's Final Five surprise, the Huskies have high hopes for this season. Tech brings back both goaltenders, Michael-Lee Teslak and Rob Nolan (first and fifth, respectively, in goals-against last year). They also have a good chunk of their scorers back, keyed by leaders Peter Rouleau and Tyler Shelast. Don't discount the experience of a Final Five trip on this team, which will work tirelessly for coach Jamie Russell and his staff. A quick start, and Ambassadors could be rocking this winter. The good: The team concept is alive and well in Houghton, and the fans there will adore this hard-working team. Shelast and Rouleau might not be high-end talents, but they'll keep the offense together until talented freshman Casey Pierro-Zabotel arrives after Christmas. The Huskies play their first six at home, including league series with Minnesota State and North Dakota. The not-so-good: Unless Pierro-Zabotel makes a major impact once he's eligible, the Huskies don't have many guys with double-digit goal potential. There's a lot of pressure on Teslak and Nolan to keep the score down, and the defense will miss leader and minute-eater Lars Helminen. While the early home games are nice, Tech won't see their home rink for a league game between November 10 and January 25, playing 11 of 12 on the road (the only home game is the back end of a home-and-home with Northern Michigan). Had them higher before, but I have to level my emotions with my thoughts. I think this team has a serious chance to make noise, but I need to see where the goal-scoring is going to come from before I can freely accept bandwagoners. Sometimes, a team performs better when you take away the best player. Everyone else relaxes, accepts their role, and doesn't wait around for someone else to do everything. UMD players have the attitude it takes to pull this off, but now they have to show it on the ice. The good: Double-digit scorers MacGregor Sharp and Josh Meyers return, as do juniors Nick Kemp and Andrew Carroll, hard-working guys whose sophomore seasons were made forgettable because of injuries. Senior captain Matt McKnight is also healthy, and junior Michael Gergen wasn't a second-round pick because he can't do anything. Yes, Matt Niskanen is gone, but six key defensive contributors are back. Mobile goalie Alex Stalock is a super competitor who learned a lot as a freshman. The not-so-good: Niskanen, Mason Raymond, and Bryan McGregor took 39 goals with them when they departed. 17 of those goals came on the power play, and McGregor chipped in three shorties. Departed goaltender Josh Johnson was key to UMD's second half last season, and Stalock has big shoes to fill in net. Last year was supposed to be the year SCSU won their first NCAA game. Instead, the Huskies fell hard in the NCAA Regionals against Maine. The loss brought an end to the Huskies career of All-American goalie Bobby Goepfert, and it's time now to see if another strong defense can be rebuilt. Joining Goepfert on the long list of departures are defensemen Casey Borer and Justin Fletcher, along with forwards Andrew Gordon, Dan Kronick, and Nate Raduns. Coach Bob Motzko believes he has enough talent in place to win, but there are questions. The good: Sophomores Andreas Nodl and Ryan Lasch combined for 85 points last year. With Nate Dey centering the top line, the Huskies won't lose much offense even with 22-goal scorer Gordon gone. The not-so-good: Goepfert played practically every night for a reason, though sophomore Jase Weslosky has the tools to be a good one. Depth all over the ice is in question, especially at forward, where junior John Swanson is among the returnees who need to step up their production. I'm more than willing to change this. Hit me up in the comments. We have upheaval. Dropped Out: Wisconsin (#9), Clemson (#20), Texas (#21), Georgia (#22), Rutgers (#25). For the second straight week, three teams remain unchanged. Sorry, but I'm not impressed by putting a kicking on Syracuse. Not everyone will be like Louisville, after all. Wisconsin falls out because they are a fraud. They'll be one of the first back in if they can show they deserve it. Speaking of frauds, I'd like to say "Hi" to Clemson, Texas, and Rutgers. At least I knew Georgia wasn't all that good, even if I didn't make the proper pick on their game. Whoda thunk we'd see a ballot in Week Seven that has Hawai'i and Kansas sandwiching USC? Whoda thunk we'd see USC lose before Kansas did? South Florida deserves credit for their win, even if it was against a lesser team. They clearly didn't play well, but slogged their way to a win. I'm starting to like this Cincinnati team more and more. We haven't heard the last of Kentucky.